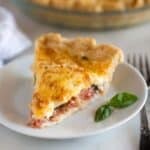 A savory summertime Tomato Pie made by layering tomatoes slices, basil onion and a cheese spread into a pie crust and baking it until golden and bubbly. This is the perfect recipe for using up your excess fresh garden tomatoes! I don’t have my own garden to care for (it’s still on my bucket list), but every summer I like to go to Farmer’s markets and buy a big box of fresh tomatoes. I’ll make a big batch of our favorite homemade salsa and I usually end up canning tomatoes and making this amazing tomato pie! If you’ve never tried tomato pie, you absolutely have to! It’s a southern dish that is one of my favorites–especially when it’s made with fresh garden tomatoes. Start by pre-baking your pie shell for a few minutes. I highly suggest using a homemade pie crust for this recipe, not just because it tastes better, but because it will not brown as quickly as a store-bought crust. I make this recipe for perfect pie crust, and I follow the instructions at the bottom of the post for blind baking the crust by putting parchment paper and pie weights down on the pie crust and baking for just 15-20 minutes. (If using a store-bought crust, only bake for a few minutes, and probably even less than instructed on the package. Store-bought crusts are thinner and will brown faster.) Then I continue with this recipe. I think roma tomatoes work best for this recipe, but you can use any tomatoes you have on hand. 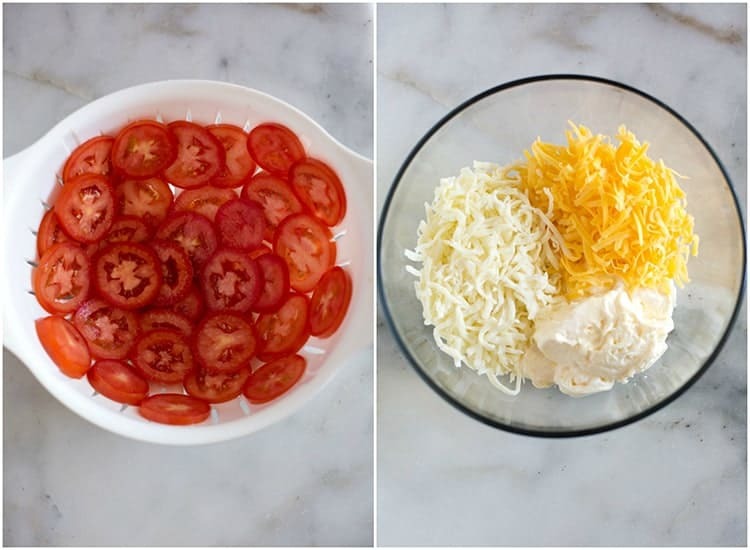 While the crust is pre-baking, slice the tomatoes into thin slices and lay them in a single layer in the colander. Sprinkle salt over the tomatoes to help bring out their liquid, and let them rest for 10 minutes. Use a paper towel to blot the excess juice out. 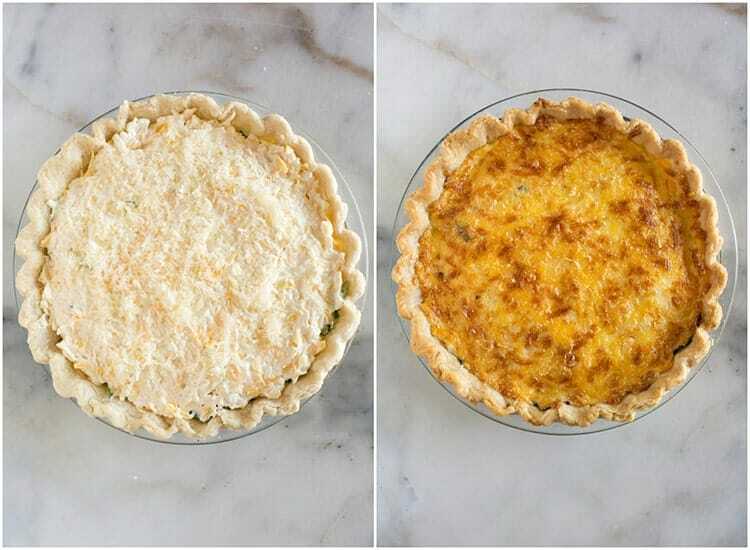 This step is really important if you don’t want to end up with a soggy tomato pie. Make the cheese topping by combining the mayonnaise or plain Greek yogurt, cheddar cheese and mozzarella. 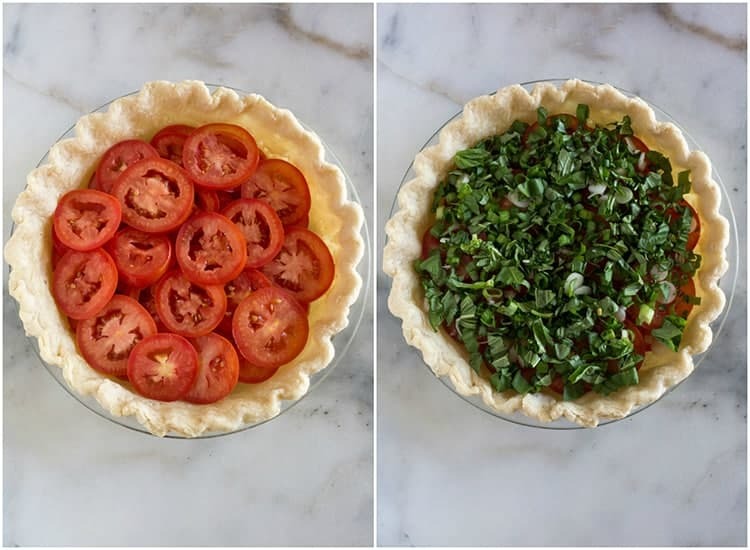 Layer the tomato slices into the bottom of your pre-baked pie shell. Chop your basil and green onions and sprinkle them over the tomatoes. Smooth the cheese mixture onto the top of the pie, and then it’s ready to bake! 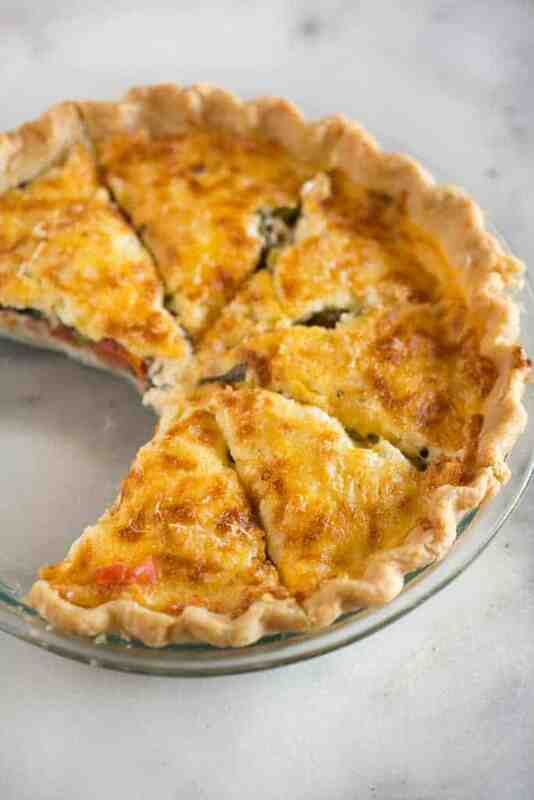 Bake the tomato pie for 30 minutes or until it is lightly browned! Be sure to allow the pie at least 15-20 minutes to cool off before you cut into it. The longer it rests, the most it well set up and it will be easier to serve. I’ve found that tomato pie is best served fresh, but you can store the leftovers covered, in the fridge. What kind of tomatoes should I use for tomato pie? To make tomato pie, I recommend using Roma tomatoes. 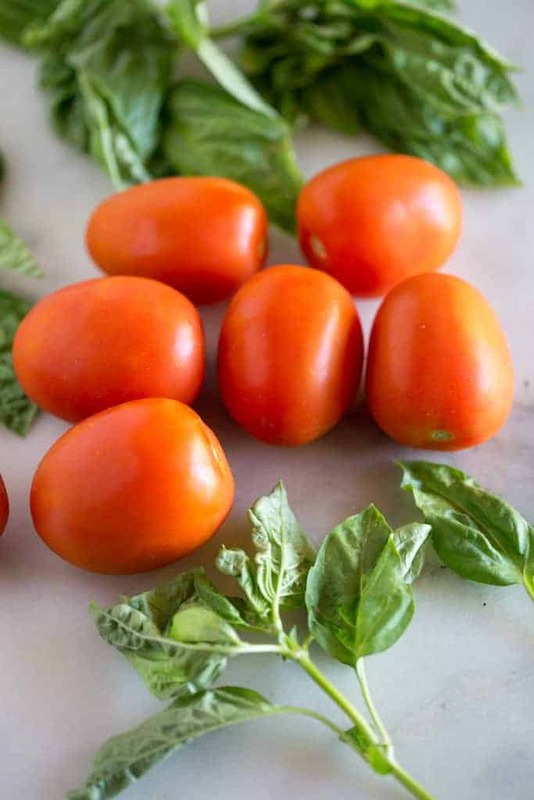 Roma tomatoes are a more firm tomato that are not as juicy and don’t contain as much liquid as other tomatoes. This is important because if your tomatoes contain a lot of liquid, they can cause your crust to get soggy. That being said, you can be successful making this recipe with any type of garden tomato. While freezing tomato pie is possible, I would have to discourage you from doing this. The tomatoes make the crust soggy and the topping on this recipe contains mayonnaise, which doesn’t freeze well. However, you can use a frozen pie crust to make tomato pie! See my perfect pie crust recipe for tips for freezing and blind-baking (pre-baking) your pie crust! 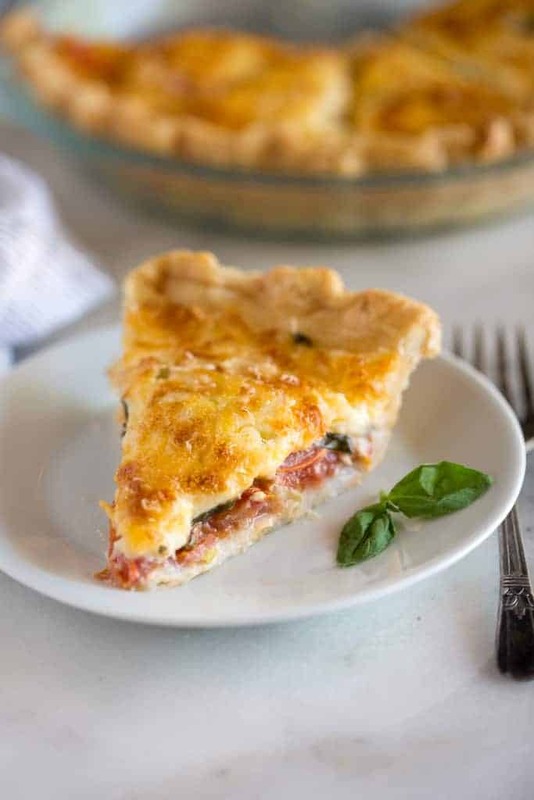 A savory summertime Tomato Pie made by layering tomatoes slices, basil onion and a cheese spread into a pie crust and baking it until golden and bubbly. Layer the tomato slices, basil, and onion in pre-baked pie shell (see my note above in the post about how I prepare the pie crust.) Season with salt and pepper. Bake for 30 minutes or until lightly browned. Allow to rest for at least 15 minutes before cutting and serving. You might also like, Garden Vegetable Pie. I originally shared this recipe in July 2014. Updated July 2018. This is a very tasty recipe. I loved it! Next time I plan to add spinach and maybe a little bit of egg. This is a recipe that can have many options. Thank you for sharing!! Great way to use up tomatoes! Your recipe is very similar to mine. However, I use sliced sweet onion that is sauteed. I layer tomato, onion and salt and pepper. I repeat this again along with freshly chopped basil then add my mayonnaise mixture on top. I sometime use a sharp cheddar or pepper jack to change things up a bit. Either way, it’s a great dish to enjoy in the summer but I make it year round. can you heat this pie after you have refrigerated it? I have made this pie numerous times and its delicious every single time. I made one just a bit ago and just got it out of the over. Gonna see if I can put a picture on here. Yummyyummytummy!